It is a real worry with the drought this year and it could have a huge affect on crops. It is really important that everyone installs a water harvester or some sort to try and save as much water as possible. 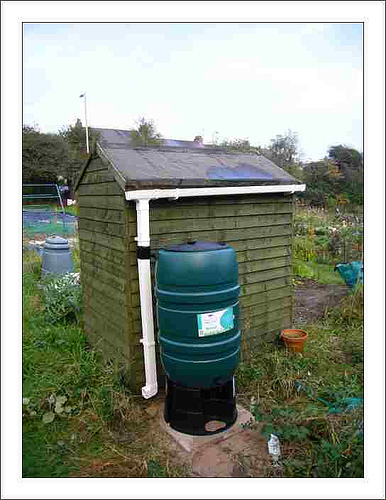 Try to find some containers to collect water or erect a shelter that can collect water. Some crops, for example potatoes, are one crop that needs water and it is feared that up to 60 per cent of crops which rely on irrigation will be threatened. Last year was the driest in this part of the country for 90 years and so it is likely that we will have a hose pipe ban unless it pours down for the next few weeks. So think about watering and only water when plants really need it – for example when planting seedlings out give them a really good soaking and then another good soaking when the flowers open and the pods are starting to swell. When planting cut the bottom off a plastic water bottle, put the spout end bedside the planting hole – for things that need a lot of water such as the cucurbit family – e.g. squashes, courgettes etc this helps the water get to where it is needed, at the roots. Make sure you install downpipes wherever possible and put water collection vessels in any places on you allotment that are likely to collect water.